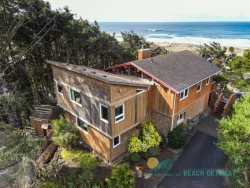 See what guests are saying about Manzanita Beach Getaways Vacation Rentals. If you have stayed or worked with us, we would love to hear about your experience. Feel free to leave feedback or contact us to talk to one of our staff if you have any questions. From Airbnb: Great home with lots of room to host one or more families. We had elderly relatives with us and it was nice to have three master suites on the main floor to minimize having to walk up and down staircases. We will definitely come back. The house was very comfortable... furnishings, beds, deco. Ahoy Matey was on point! Fully stocked kitchen. Linens, pillows, and towels aplenty. Location was just a short walk to beach access, few small hills to navigate but nothing outrageous. Bluetooth speaker in living room was a nice touch as music is a must for our family! BBQ out front fired up easy and was very clean...helped bring the turf on home for our surf n turf night in! Overall an excellent spot that helped us enjoy our awesome weekend at the Oregon coast!! We were researching another property of yours to stay in this summer, only because Classic Ridge was already booked that week, and a Quality Control lady was on site at that property. She was so warm and welcoming, giving us a personal tour. We loved that house too and booked it immediately. We appreciated her customer service and willingness to take a few minutes to show us around. Thanks! We LOVED this house! The location was amazing-just a two minute walk to the beach. The house was very spacious, clean, and had a nice view. The only issue that came up was, the house was unexpectedly attach to another house-similar to a town home but didn't feel like a town home. This wasn't advertised. Luckily it didn't affect our stay as we didn't hear the people staying in the other house and only saw them a couple times. Overall, great property and location. I'd definitely go back! They were wonderful. Helpful and kind and very thorough. This property was perfect for us. Plenty of space, clean, amazing location and really helpful and friendly staff (they happened to be leaving when we arrived and they were so kind and helpful). We also enjoyed the neighbors. Kitchen is very well stocked and the beach gear was great to have. We'll definitely be back. We loved it! We'll be back! No contact other than initial question, but person I spoke with for that was very helpful. Great place for 3 adults & 2 teenagers! Clean & comfy. Loved having a wood stove & all the books on local sites. Deck furniture could use some sprucing up or updating. Would have liked to have been closer to the beach but description of location was as stated in property description and easy parking right at the beach.